Most everybody does it. Makes New Years resolutions, that is. In the 3+ years I have been blogging, I have not written mine down (and thus have not been forced to hold myself accountable) . Oh, except the year that I wrote I would compete in the Danskin Triathlon. And then missed the signups. So there's that. Sign up for a(nother) Half Marathon this year. Be less sharp-tongued with my Hubby. Work closely with Hubby to set some financial goals for our family. Make myself invaluable to the company. Create more "Work Smarter" protocols for my position. Only eat lunch out once a week. Try to build a relationship with someone in marketing (see Blogging). Spend more 1-on-1 time and attention with each boy. Attend conference(s) to meet writers whom I admire in real life. First up? Spending the weekend before my 37th birthday at BlissDom! Are YOU going?? Seek out paying writing gigs. Try to create a relationship between myself, my employer, and my blogging. Continue promoting Fishful Thinking by coming up with new and inventive ways to spread its positive parenting message. What are YOUR resolutions for...When? 2010! Good for you for your resolutions! If I did resolutions, I'd be with you on the weight one - I'm in the home stretch of WW and only have 10 more pounds to go. Why are they always the hardest? Found you through SITS - you were ahead of me in roll call! I resolve to relax and dial it back a tad. It's starting to snow again, so maybe the weather will allow me to sleep in later this week? SITS sent me by, and I'm glad they did! Whoa! This is quite a list. Very ambitious. I can relate to most of your items. Good luck! I did start meal planning a while ago and it's saved me money and made mealtimes much easier. I like how you slipped in your birthday date. I just started my blog so I am still just learning. But so far so good. And of course I want to loose weight and save/make more money. So we shall see. I'll tell you, I'd kill to have someone other than me in my office willing to contribute to blogging or tweeting for the company. Sniff out that marketing contact. They'll hug you for it!! love your goals friend - but i got sidetracked at mayo and cheese. So jealous you're going to Blissdom... so many of my "bloggy" friends are, but I can't get off work! Boo. Creating a weekly meal plan is something we started in my household in 2009. It's morphed a little over the past year, but it's really saved us a lot of time and stress during the course of the week. Good luck to you! I am thinking really hard about that conference resolution, too. I have my eye on Mom 2.0 Summit, but my wallet is screaming, "Noooo...."
How fun that you get to go to Blissdom! Lose 20 pounds (By focusing on calorie-counting and regular exercise and not eating leftovers off the boyz' plates, dammit.)". I lost 30 lbs. this way! I never make new year's resolutions because I never stick to it! But - I do have a resolution this year and it's to stop saying "yeah." It's "yes" not "yeah!" 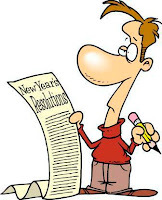 I am not making resolutions instead I am making a list with my husband of things we want to do in our life. then we will plan to cross at least 2-3 a year! I still need to write down my list of goals too. My hubby is trying to eat better too - they do get a little cranky when they cut down on the calories, don't they?